We have a solution for every door size and requirement from a vast range of the highest quality high speed door systems using the very latest technology. 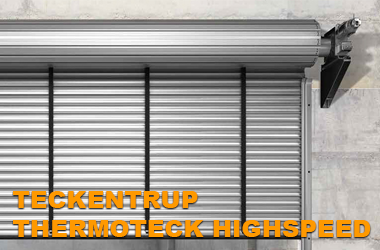 High Speed or 'Fast Action' Roller Shutters are used for many applications where high traffic volumes require a door to keep a building environment and temperature as constant as possible. The high speed door can travel up in as little as 2 seconds and close as quickly for maximum efficiency. Some door models are specifically designed to keep cold in for refrigerated rooms, warehouses, etc.. High speed (or 'fast action') Shutters are usually manufactured from very strong material with the option of clear vision panels built in so you can see what may be happening on the other side of the closed door. Samson also offer a range of high speed aluminium roller Shutters and 'spiral' doors an adaptation on a sectional door but operating at high speed. They also help to keep dust, rain and wind levels lower in a building. 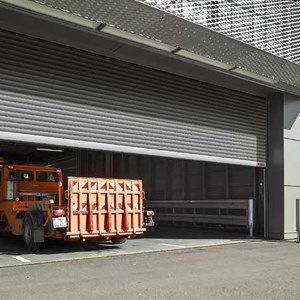 If they are to be used on the external perimiter of a building they are usually combined with another door such as a steel roller shutter or sectional door to secure the premises when closed during non operational times. 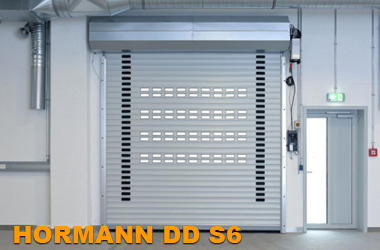 An alternative solution to this scenario is to specify a Hormann HS 7030 PU speed roller door which is one of only a limited specification insulated high speed roller doors in aluminium sections, available with punched and glazed vision panels. This roller door offers the best of both worlds, a secure roller door combined with high speed opening and closing - a true engineering masterpiece. Fast action shutters will keep the temperature inside a building as stable as possible whilst traffic enters and exits all day long. During winter months savings in heating costs can be enormous whilst maintaining a pleasant atmosphere for staff inside. A garden centre is a good example where internal temperatures need to be kept constant not only for the plants but also the customers. Large garden centres will have regular movement of goods and people from inside to outside all year round. A cold store is another good example. For division of internal areas and rooms within a building the high speed door is perfect and available in many colours with various sized vision sections. Operation can be designed to suit the type and frequency of traffic too with radar detection, magnetic induction loops, radio control, wall mounted push buttons and so on. The level of safety is also extremely high with bottom edge sensor and infra red beams as a minimum. Samson Doors offer a full survey, supply and installation service for all the high speed roller shutters along with service, repairs and maintenance packages to suit your doors. The high speed door is an ever increasing requirement in our cost conscious environmentally conscious world. The loss of heat from inside the building can cost thousands over a year, especially in a large building, and the same for keeping a building cool in the summer. 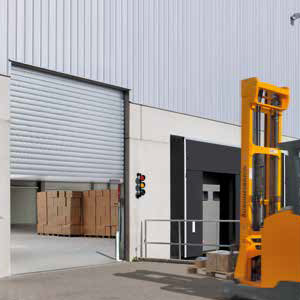 The developments of high speed shutters in the last 10 years have been enormous with reliability and safety being highest on the agenda to ensure a busy warehouse or factory is kept operational, even perhaps after a crash into the door. Safety to prevent any possibility of injury to staff or vehicles. A modern high speed door offers so much more than it used to with modern materials and technology in electronics and motor drive units. Samson can truly provide high quality doors capable of making your business run smoother and more efficiently. More access controls than ever before for total control of the door from nearby or as far way as required with safety controls to suit. A high speed shutters is normally quite a high cost investment and like any products badly specified can end up costing you a lot of money over a period when corners have been cut in the procurement process.